The book paints a detailed picture of an important transitional period in the country’s cultural history. It’s an aspect of cultural history the impact of which extended far beyond the country’s borders and continues to leave its mark on the cultures of countries around the world. The DeMille influence is felt right up to the present time—in the work of modern filmmaker Steven Spielberg. Of course, the key word is detailed. Eyman’s historical research has dug up details of all sizes and he serves us his smörgasbord of informational tidbits all on the same sized plates. No fact is too small or too trivial to be delivered to the reader’s table. The problem is that there is such a thing as too much information. The author fills almost 600 pages with deeply revealing anecdotes followed by torrents of data that would have benefited from a judicious trimming. For example, he serves up the full text of a series of telegrams concerning screening problems with the first print of DeMille’s film Squaw Man. We are given ledger entry details about the cost of everything from film stock to costumes to set pieces. Even so, Eyman’s work cannot be easily dismissed. It is filled with rich insights about movies and about the controversial man who is one of the godfathers of the art form. The author never loses sight of the fact that DeMille the movie genius was also DeMille the human being. We are shown the painful details of his decades-long marriage to Constance that ended with her locked in the memory-less prison of Alzheimer’s disease. In the end she only recognized Cecil as the kindly old gentleman who sat and held her hand almost every day. We see the benevolent uncle Cecil who indulged the dance aspirations of his young niece Agnes DeMille and helped financially to launch the early career of Agnes’ friend Martha Graham. However, this same dear uncle later dismissed Agnes quite rudely as the choreographer for his epic film Cleopatra and banned her from the set. The biographer also maps Cecil’s journey from a conservative, but humanitarian-minded citizen of Hollywood to a right-wing super patriot who helped architect the notorious blacklist that ruined careers and drove a number of actors, writers, and other movie personnel to suicide. 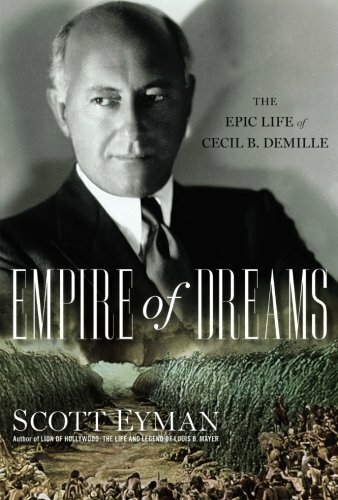 Empire of Dreams is a must read book for movie buffs and culture historians. Don’t be afraid to skip around a bit. As stated, there are informational gold nuggets scattered throughout the thick volume.